The City of Centerville’s annual Memorial Day ceremony at the Veterans Memorial in Stubbs Park, 255 W. Spring Valley Road. In commemoration of Memorial Day, the City of Centerville is remembering those who have died in service to our country with a ceremony saluting the men and women who helped protect, preserve and maintain our freedom. 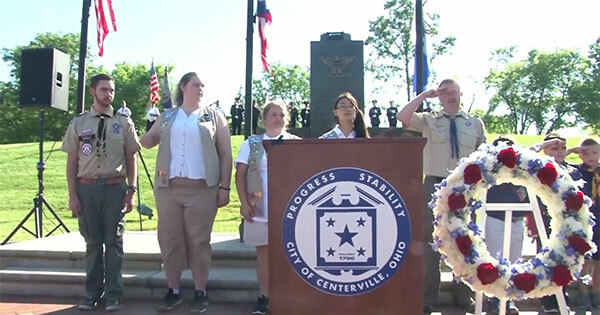 Scheduled for 9 a.m. Monday, May 27, at the Veterans Memorial at Stubbs Park, 255 W. Spring Valley Road, the program includes color guard presentations from Centerville VFW Post 9550 and Centerville Police and Washington Township honor guards, and remarks from Centerville Mayor Brooks Compton. Find more events like "Centerville Memorial Day Ceremony"
Leonard E. Stubbs Memorial Park & Centerville Community Amphitheater is located west of S.R. 48 along the north side of W. Spring Valley Rd. next to the Centerville Police Building. Stubbs Park provides numerous amenities to the public including state-of-the-art playground equipment, basketball and tennis courts, and an inline skating rink.